MAF in PNG is one of our largest programmes, providing life-changing service to the seven million-strong population. Every year, we perform around 500 medevacs, saving hundreds of lives. 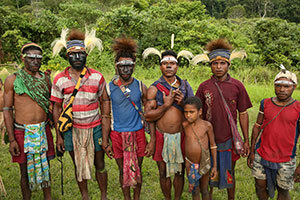 PNG is mostly jungle-covered mountains or swamps and there are very few roads. For many communities, medical care is several days trekking away. In medical emergencies (broken limbs, snake bites, pregnancy and birth complications), getting help without MAF is next to impossible. 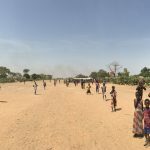 Likewise, many communities depend on MAF’s air transport for access to school teachers, health programmes and development agencies, Bible translators and church leadership. By necessity, many landing strips on sharp ridges or cut out of the jungle resemble little more than a cricket pitch. 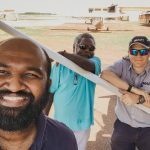 They present just one of a multitude of challenges that have deterred other air operators, meaning the much of the seven-million strong PNG population turns to MAF for access to help and hope. With some of the most extreme terrain in the world, combined with unpredictable weather, a MAF pilot’s skills are tested to their limit in PNG. 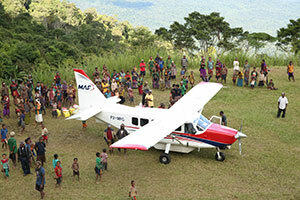 MAF in PNG is one of our largest programmes, providing life-changing service for much of the rural population. Every year, MAF carries over 33,000 passengers in PNG of which around 500 are medical emergency, saving hundreds of lives. Delivering building materials for hospitals and schools, encouraging community development by transporting coffee and other produce from remote villages, MAF is a lifeline for many of the PNG nationals. Doctors, teachers, church and mission workers could not do their jobs without MAF to transport them over PNG’s challenging landscape. Tom and Gemma have been called to work in Papua New Guinea with Mission Aviation Fellowship. MAF pilots Mathias Glass and Sebastian Kurz discover the excitement and transformation a new airstrip can bring.